There is very little advertising in each issue of UPPERCASE. This is partly by design since the few ads I do run have more impact for the advertiser and hold more interest for the reader (and leave more room for content!) but it is also out of necessity. Being a one-woman magazine operation means I don’t have a lot of time to dedicate to finding advertisers. My goal is to find two advertisers per issue—one for each of the inside covers—plus an assortment of Calling Card ads and Peeps round out each issue. I was happy when, out of the blue, the folks at Fossil contacted me about placing an ad in the current issue. They’re certainly the biggest brand that has advertised with UPPERCASE, but they’re also a great fit: with beautiful products that I personally already use (my watch, for example) and a company culture driven by design, Fossil has employed and supported many illustrators and designers within the larger UPPERCASE community. What kinds of books, magazines and reference materials are at the Fossil Library? The Fossil Library is open to all employees, but specializes in connecting our design teams to Fossil’s shared creative resources. We have a variety of materials, from books on Expressionist woodcuts and jazz album covers to a circulating iPad full of digital magazine subscriptions. In addition, the Library manages collections for our product design teams, the largest being our collection of retail and vintage samples. Imagine a circulating library, but instead of books, it’s bags, belts, textiles and anything else you can imagine. How is the library curated? You can’t always anticipate where creativity will lead people, so much of the collection development is in response to designers’ requests or from conversations with employees about the directions their work is taking. That said, the library fills gaps and anticipates user needs by acquiring titles that are crucial for a well-rounded design resource center to offer. The other major driver is our seasonal brand stories— the Fossil brand team helps to curate resources that will support their vision for upcoming seasons. How did you hear about UPPERCASE magazine? This first time I flipped through an UPPERCASE issue was at Salvage Ltd in Arlington, Massachusetts. When I came on over three years ago and started managing our journal subscriptions, UPPERCASE was a magazine I knew that the Library, as a resource center for hundreds of creatives, had to have. This impulse was confirmed over and over again, as it’s one of our most popular titles. The magazine is so well curated and colorful—it just makes you smile. According to our designers, UPPERCASE is adored because it’s eclectic, practical and made for creatives by creatives. Charming, whimsical, surprising—these are all words used by our designers to describe UPPERCASE. As many Fossil employees are lovers of historical ephemera, we are always delighted to see celebrations of the cultural paper trail in UPPERCASE—like the piece on ham radio cards from issue 20 and the midcentury letterhead feature from issue 19. We’re currently celebrating Fossil’s 30th birthday, so our archives have been heavily mined this year. The archives contains packaging (we have a full archive of our signature watch tins), catalogs and mailers, advertising collateral, newsletters, press releases, merchandising props, and of course, product, including watches, bags, belts and clothing. Our digital archives holds commercials, internal videos and our art department’s work from the past twenty years or so. The archive is growing as we are striving to collect some of our oldest and rarest designs. And several times a year, the library works with design leaders to pick the best of the best designs to add to our seasonal archive. What is the coolest item in the archive? It's tough to pick just one! We do have some particularly great items seen in the retro future story, which is a recurring theme that has popped up again and again over the years at Fossil. As early as 1991, you can see a retro-futuristic influence in Fossil's packaging and product. These robots, rockets, ray guns, galactic travelers and other symbols of other-worldly adventures were inspired by late 1950s visions of a fantastic future. Fossil has looked to the story of retro future once again for the Holiday 2014 collection. Taking the best elements of midcentury design culture and infusing it with humor and whimsy is what Fossil does best. How do designers at Fossil typically use the library services? It’s a function of both reference and inspiration. Someone may need to get a better grasp on a subject they are already familiar with, or perhaps a topic they have been assigned to research, and we work together to locate the best resources. Other times, they come from a place of curiosity or a desire for new thinking. Our fully-automated library consists of about two thousand books—big enough to provide a little of most things design-related, but small enough to easily browse for inspiration, both in person and through the digital catalog. How does the library assist the Fossil brand and company culture? The Library is here for anyone to use for inspiration, reference, or simply a place to get away from your desk and computer for a little while. It’s a welcoming, open space that encourages creativity and collaboration, which are both so crucial to the Fossil identity. Quite simply, the Library is a creative haven. Based on what people are interacting with in the library, can you see trends in style and design emerging? It seems that one of the biggest developments in creative culture is a shift toward authenticity and craftsmanship, even as creatives retain a passion for technology and how it can support innovation in design. 3D printing, wearables, hackerspaces—these emerged from a desire to explore what role technology plays in self-expression, and the urge to find self-fulfillment through the creative process. Maker culture supports innovation that is practical, progressive and collaborative. It’s an emotional, optimistic movement that touches all aspects of design, especially at a company like Fossil that looks to both the history and the future of style and design to define our aesthetic. Thank you to Laura and the team at Fossil for sharing these behind-the-scenes with us! For a look at Fossil design process, visit their blog. And please check out the Eley Kishimoto x Fossil collaboration that is advertised in the current issue—it's full of pattern designs plus some really bold retro-inspired watch designs. Would you or your brand like to advertise in the pages of UPPERCASE next year? Download the media kit over here. 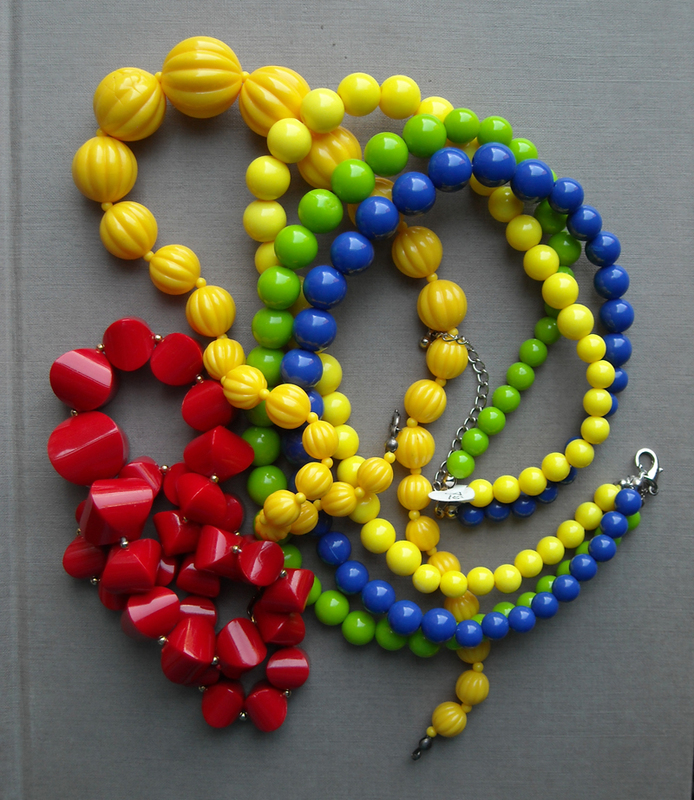 I've always been a fan of Kristina Klarin's large painted wooden beads. Her colour choices are always so interesting. She has just released a new collection, styled for fall, the entire design experience of her online shop is great. This is no ordinary production line: skewers of freshly painted wooden beads pierce magazine stacks and finished necklaces hang from any available hooks or frame corners of the room. It is awash with vibrant colours, almost as if someone had popped open a fantastical bottle of champagne, its bubbles filling the room with pictorial joy. Beyond the immediate sensory overload, one rapidly notices the subtle elegance behind each colour combination. There is not a single faux pas as colours marry each other and respond to each other but never clash with each other. This is a delicate exercise in assembling the right shapes with the right hues, one that Kristina Klarin excels in. Read the full article, written by Olivier Dupon, in issue 15 of UPPERCASE. The highlight of the Creative Stitches show this afternoon was meeting Lisa Griffiths from Envy Camera Accessories. I was immediately drawn to her booth—her display of the colourful strap designs caught my eye and I had my (heavy!) Canon 5dmkii slung around my neck. I've coveted a more stylish camera strap and thought someday I'd make my own, but that's so far down on my to-do list, I might as well forget about it. Lisa to the rescue! Made with pretty jacquard ribbon, each strap is reversible with contrasting or complementary designs. She has various kinds of straps and harnesses and wristlets for a variety of cameras and uses. The patterned part of the straps can easily be clipped on and off, so if you want to change straps to suit your mood or outfit, that's easy to do. Lisa's a mom of three and also runs a day home, so she gets her sewing done in the evenings. Her straps were inspired by the need a photographer friend and she likes that she's able to make them fairly quickly—important since she has limited time but wanted to launch a creative sewing-based business. Envy Camera Accessories is local (based in Okotoks) but if you want to be the envy of your friends, Lisa has an online shop (free shipping in Canada.) She'll be at the Creative Stitches show on Saturday and then some holiday fairs as the season approaches. Here's the lovely camera strap that came home with me! Thank you, Lisa! Shabd Simon-Alexander: Dye it, Wear it, Share it. Booth sketch for Shabd by Caroline Zucchero Hurley. 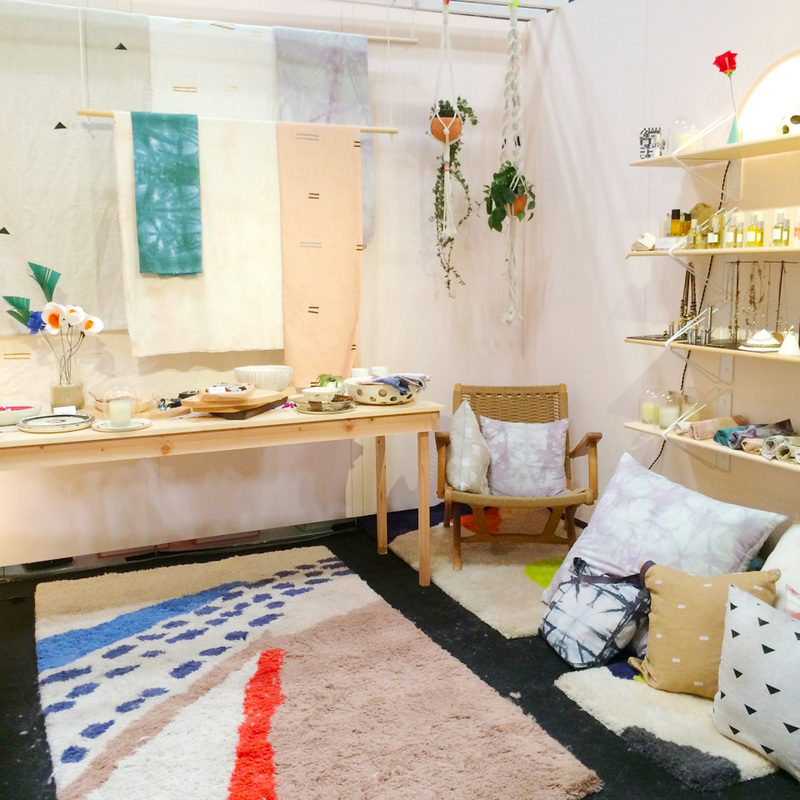 Shabd's booth at NYNow, a home and lifestyle event on until Wednesday. Instagram photo by @carozucchero of @shabdshabd space. Shabd's colour testing for a secret project. Shabd Simon-Alexander is a tie-dye expert (she wrote the book on it! We feature an excerpt from it in the current issue). She is showing her new products at NYNow, and an email about the show prompted me to head over to her Instagram to see more. Click on the images above to view in Instagram and you'll find some colourful and creative accounts to follow! In 2012, Sarah Cameron started a custom clothing design, alterations, and wardrobe consultation company in Calgary called Pure Couture. Before starting her own company, Sarah worked for a vintage clothing store as a vintage clothes hunter. Each day she travelled to a clothing warehouse and went about hunting through piles and bags of clothing seeking unique vintage clothing and accessories to be sold in store. Tell me about your job as a vintage clothes hunter working at the clothing warehouse. What was your job like? I had a master list of what the store was looking for, and I would open bag after bag hoping for something amazing. It was hard work, but super rewarding if—after digging and searching and ripping open bag after bag—you found a real vintage Chanel bag, a beautiful embroidered wool parka with fur trim, or the perfect worn-in-just-right leather biker jacket. If I was really lucky, I would find a band t-shirt from the 70s. If the store I was picking for did not want what I found, I could buy it myself at a crazy cheap price, like a dollar fifty a pound. It was a very lonely job, though, because I was the only one searching for finds. What were some of the unique things that you found while working there? The best situation was if I could find beautiful leather shoes from the 40s and 50s—made in Italy and just so gorgeous. I once opened a bag, and it was full of shoes like that. Some little old lady must have passed away, and no one wanted her amazing shoe collection. That was a good day. My boss was super happy! Tell me about the quilt that you made your daughter from the fabrics that you found while clothes hunting. Do you remember when you found the fabrics? It all started with a dress. I found what looked like a old 50s-style dress that was falling apart, and I saw past that. It was made out of beautiful blues, greens and purple, it was a rose print but sort of modern. It was perfect. It not only inspired the quilt but most of my daughter's room decor. The back of the quilt is made out of what looked to be a old sheet. But not just any sheet—this was a beautiful teal and peach floral print. The both of them just fit, and along the way I found a few more remnants here and there. I started collecting fun fabric when I started clothes hunting in 2010, and when I found out I was having a girl I knew I wanted a baby quilt for her. What do you enjoy about fabric patterns? Why do you like vintage ones? I love unique fabric, but not fabric that's too weird. I think thats why I love vintage fabric, its different, but something about it is so happy and fun. I started "sewing" when I was about 10 years old and I was bored with my Barbies' clothing and wanted to design my own clothing for them. The clothes I made for them were mostly taped together. My grandmother gave me a sewing machine when I was about 12 and I loved it! She inspired me, and gave me everything I needed to start sewing. I still have my first sketch book from her. She wanted me to see beauty all around me. What do you enjoy about sewing and designing clothes? I enjoy designing clothing for myself, my family, and my clients. The best feeling is when people try a piece of clothing on I've made for them and it fits just right and feels just right. I have had a few clients cry over a perfectly fitted dress! What made you decide to go into the Fashion Design program at Saddleback College in California? I was sort of unsure what I wanted to pursue in college. My first semester was a mish mash of classes like marine biology, rock climbing, and introduction to fashion. When I realized I could have a career doing something I loved, I jumped at the chance. I was really lucky because the program at Saddleback was amazing! Visit Sarah's portfolio for some vintage-inspired couture. Polkka Jam is a designer duo from Finland made up of Kristiina Haapalainen and Sami Vähä-Aho. Their spirited design collection called Huvila (Villa) is now being sold in Sokos and Prisma department stores in Finland. Polkka Jam started out as just the two of you, Kristiina and Sami. How did you get your brand noticed? We have received attention little by little. Maybe our products have something special that catch people's eye because customers have found us without us doing much marketing. Some of our collections do get more attention than others. Doing collaborations with other companies is also a good way to spread the word. We started by printing t-shirts, gig posters and cards in our home over 10 years ago. We wanted to do everything by ourselves and it was strictly DIY. Since then we have been working and doing many kinds of things in the field of design. We have designed clothing, patterns, album covers, illustrations for magazines, books, etc. Polkka Jam also had a brick-and-mortar shop for three years in city of Turku, Finland. Over the years your brand has become more well known. What has it been like having your designs sold at large retail companies like Sokos and Prisma? These are big steps for us. We started as a little "handmade at home" brand. It was good that way for a while, but nowadays we are very happy to do collaborations with other companies. It is nice to see our designs in big department stores as well as in smaller boutiques. One of our goals was that our brand could be available everywhere and for everyone. What have been some of your favourite designs to work on so far? The latest collection, Huvila, and its designs are always our most favorite ones! But maybe some of the "all-time" favourites are the illustrations of Puutarhajuhlat (Garden party) and Talviuniset (Winter sleepy) collections. We have collaborated with Lapuan Kankurit company on some patterns. Their products are made using the traditional jacquard weaving technique. It was very interesting to figure out how our designs would look like with a technique that was new for us. Another really nice project was designing the paper collection for the Japanese department store Plaza. It was great since we love all kinds of stationary products. What made you decide to contact UPPERCASE? Are you a reader or subscriber to the magazine? We found UPPERCASE online and fell in love with your magazine. We bought the magazine when traveling abroad and have followed UPPERCASE since then. What do you see as the future of Polkka Jam? Where do you see your brand in ten year's time? We would be happy to continue working like we have been so far, and growing our business little by little working from Kimito Island where we live. Besides working on our own collections, it would be really nice to start some new interesting co-operations with other companies. Projects that are not only about the physical products but also about offering the know-how and talent that we have. Also doing bigger stuff like installations and murals would be great! "Two of the birthstones for the sun sign Sagittarius, both are energetic power houses. Both have very powerful metaphysical and spiritual healing properties. Turquoise can, increase Intuition, wisdom, happiness, serenity, creativity; empathy, positive thinking and sensitivity. Onyx, connected to the earth and lower chakras, balances masculine and feminine polarities. Activates the memory and helps one understand the reality of the moment. Onyx helps one have self control. Black onyx is very helpful with focusing energy in positive ways." Ria Faust's company is Sugarcane Toddler. Her first mini collection of clothes will launch soon. There was an audible "awww" from the audience at 3 Fish Studios, registering their approval of the cuteness factor of Ria's clothing designs! "Sugarcane has teamed up with Anthill Fabric Gallery for fair trade of native Filipino textiles. Anthill fabrics are intricately woven on wooden looms by artisan mothers, supporting their families and preserving their craft. These days indigenous fabrics see little use. In order to preserve the art of hand loom weaving, Sugarcane is exploring a new way of using traditional textiles with kids' clothes." Ria's daughter Amelia (below, in the yellow dress) didn't quite have the stamina for the whole Show and Tell evening, so unfortunately Ria had to leave quickly after her presentation. Read Ria's post about her Show and Tell experience on the Sugarcane Toddler blog. Thank you, Ria, for an excellent presentation and lovely clothes. has collaborated with fashion houses such as Chloé and Chanel, creating hand embroidery designs for ready to wear and haute couture. In her new online shop, All Over Sequins, she's taking the high-end techniques and presenting them in easy-to-achieve embroidery kits. Starting with embellished canvas totes, stitchers can practice some basic embroidery and embellishing techniques. She also has a variety of sequins and cabochons supplies for those who want to experiment. How and why did you become an embroidery designer? I’ve always loved to make things with my hands. And I have always loved beads and pearls. I remember I had my own little jewelry line when I was 15 and I used to sell my necklaces to my friends’ moms. I initially wanted to be an accessories designer but I had a sort of epiphany during my first day at Chloé: I realized I loved embroidery. Later, I got offered the job and it all snowballed from there. Since becoming an independent embroidery designer in 2008, I have been able to collaborate with great brands, creating amazing pieces with some of the most talented ateliers in the world. I grew up in Mexico city, in a very creative and inspiring environment, speaking three languages and taught to be very open and curious. I love to travel and to experience other cultures so that has helped a lot for my work. I’m a very hands-on person, I like to make things myself to understand how they work. What I know of embroidery, I’ve learned from my grand mother but also through trial and error. What is your creative process when working on an assignment? versions of placements. It’s an organic, intuitive process. Visit the All Over Sequins blog for tutorials and a bit about the history of sequins and embellishment. There's a new store in North Vancouver that looks quite nice. The Mill is a furniture and interior design shop that features vintage finds, textiles, upholstery and gift items such as cards and jewellery with a focus on local and handmade goods from the Vancouver and Pacific Northwest area. Looks like a nice place to visit! Kari Woo creates simply beautiful sterling silver jewellery such as the pendants shown here. Some whimsical, some graphical, her earrings and pendants are expertly crafted. For those of you in Calgary, you might remember Kari as one of the founders of Influx Jewellery Gallery, my neighbour in Art Central. Though Influx has a new owner (please visit Amanda at Influx for contemporary Canadian jewellery), Kari has moved to Canmore to raise her little boy and is still making work. Visit Kari's Etsy shop to peruse her wares. "They're an ode to my Auntie Majbritt. Headstrong with an opinion on everything. Passionate about art, literature, philosophy and life. Never left the house without her bright red lipstick, a beret and a scarf." I absolutely love Kateri Morton's necklaces made from vintage lucite beads. These two shown above, in fact, are ones that are part of my daily wardrobe. Look for a "Frugal and Fancy" column about Kateri's Etsy shop, Urban Legend, in the fall issue of UPPERCASE (out in October). get remade into sophisticated studies of colour. A selection of photos of my tour of Eva Franco's studio. To see larger images and a few more, please visit the Flickr set. Ok, so here's my second attempt ever at "fashion blogging"! Eva Franco's Frames and Fortune print and dress seem to be tailor-made for me. It's available on ModCloth with a selection of other great Eva Franco dresses (and these shoes). I've started a Pinterest board for Eva Franco designs I love. In Issue #13, I shared my experience about visiting the Eva Franco studio in Los Angeles last summer. It was an amazing experience to meet with Eva and see the full scope of her fashion enterprise: from the inspirations and sketches to the samples, manufacture and warehousing. I'll be posting more about Eva throughout the day—let's start with her design process! This happy assortment are the Shoegazing Notecard designs from the set I curated and designed with Chronicle Books. Pretty shoes and confetti—a combination suitable for lots of occasions or even an everyday hello. The pretty box with a scallop motif. Kate Woodrow, who was my editor at Chronicle Books on this project, emailed today to share that our Shoegazing Notecards are nicely featured on the Papyrus website. (Check them out in the banner!) Papyrus is also having a big sale: buy one stationery set, get one for 50% off. So, start with Shoegazing Notecards and perhaps the lovely Polaroid set as well? Emily Chalmers: Caravan, Flea Market Style, Modern Vintage Style... Chances are, you love Emily's styling aesthetic as much as I do. Emily generously wrote the introduction to Tif Fussell's Dottie Angel book and though she and Tif were acquainted, I had not yet had the pleasure of meeting Emily in person. We arranged to meet for the Thursday vintage market at Old Spitalfields Market. Emily has a 4-month old (beautiful!) daughter who napped in her white pram while we strolled the booths. Emily's old and new, mix and match style makes for homey and eclectic rooms—as well as a unique personal clothing style. I always admire people who can wear vintage pieces, but it never seems to suit me. I loved the textures and contrasts of her outfit. The child's rolltop desk was something we both instantly were drawn to. Emily's daughter will get use this as she grows older and arrangements were made to bring it home. I could easily start a collection of antique ink bottles, but I resist the urge! Me in my yellow jacket besides some typewriters. I have seen a lot of Londoners in the past week and I have not seen a single soul wearing a yellow slicker. I would have purchased the tin sign "World's Greatest Weekly for Women" if it would have fit in my luggage.